APOLOGIES FOR OUR FRONT PAGE GOING MISSING, WE ARE WORKING ON THAT CURRENTLY TO EITHER REPLACE IT FROM BACK UP OR REDO IT. SORRY FOR ANY INCONVENIENCE. The history of MIJOY is lower down on this page. I have been involved with the Yorkshire Terrier breed in excess of 30 years owning my first 1kg dog at this time. 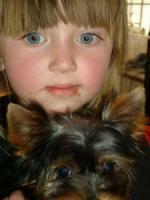 We at Mijoy breed the Yorkies as companion, pets to approved homes. Our pups are home raised, completely socialized, in excellent health and quality dogs. Our dogs are not kenneled and enjoy a family environment. We breed all sizes of Yorkies specializing in the "Tiny Tots" Our dogs are sold with contracts, are micro-chipped and de-wormed, inoculated, and Registered with KUSA. They carry certain health guarantees. Our dogs regrettably are not sold for breeding purposes. Furthermore our tiny dogs are correctly bred, and reared. (Please see relevant articles on Teacup and Pocket Yorkies) Please note a fair amount of our pups do not conform to the Breed standard as the standard calls for a 7lb dog andmost of ours are well under that weight. Our purpose for breeding these pups is to offer you, the public the benefit of owning a super, little companion, full of life and lots of love to give, a healthy bundle of joy. We pride ourselves in offering our Buyers full back up support. Complete information and welcome, being of assistance to anyone needing advice or help to the best of our ability. If you choose us to purchase your puppy from, we look forward to a long and rewarding relationship with both you and your furry companion. Some months back we became involved with the BIEWER terrier. Our aim is not to breed these by the dozen, but to breed the odd quality pup. The female we own at present is of outstanding quality. She is on the smaller side, brilliant colouring, excellent conformation, we are very fortunate to own such a top quality Biewer as our first one. Currently there is no stud suitable for her in South Africa, we are hoping that will change in the next year or two. I will not mate her just to get pups, but will wait for an appropriate knight in shining armour to arrive to hopefully achieve what this is all about, breeding to improve the quality of the Biewer in S A. Our Yorkies have and always will be the apple of our eye, and we are very blessed to share our home with such delightful and wonderful little companions. The odd divine Biewer Terrier will be most welcome. We are not big breeders, we only breed with quality, healthy registered dogs. We only allow our girls to breed for a certain period thereafter, they are spayed and enjoying their life romping in the garden or lying on the bed. All our pups are guaranteed for the first year of their life. Our tinies all have their eyes tested, by the Eye clinic The yorkie breed can have problems with their eyes, and we would not want to pass that on to any purchaser of ours. OUR PUPS are all examined by our vet, prior to going to any new home. They are also inoculated and dewormed and have an Identipet Microchip implanted. We are very proud of our pups and our dogs, the reason a large volume of our sales is repeat business. Thanks to all of you. I am sure I have left out a number of you, SORRY, you are all very special to us. You and your dogs. I am a real animal lover of note. Starting rescue work in my teens. I have always loved animals, but did not have many as a child growing up, as my father suffered terribly with Asthma, and pets fur really did a number on him. He was however very much a lover of animals as was my MOM. My father wanted to become a Vet as a young man, but then went to varsity and studied electrical engineering. We had a couple of dogs over the years and a budgie called Jocky. We as a family, were regular visitors to the Rand Easter Show on an annual basis, and it was at those shows that I developed the love for the Chinchilla. The (rodent). I now have chins but they are pets and my interest in them is purely for the love of them, not to make money from breeding them. I guess the time will come when I will indeed have the odd baby for sale, but that will be down the road and something that I am not concerned with at this stage. I left home and married and as a young woman, started rescue work seriously. A few years down the road I became a full time mother, and had the opportunity and started breeding Persians. I got divorced after a good few years of cat breeding. I still stayed very much involved with the breeding of top quality, Persian kittens. I remarried four years down the line. I bred Persians for twenty years at which stage I decided to quit. My love for yorkies has been an on going thing for many years and I owned my first 1kg dog more than 32 years ago. I bought an afghan � as I admired them tremendously. The Breeder suggested I show the dog as he was quite exceptional. Justin we purchased at 8 weeks of age, and I trained him, not in obedience but show training. It took hours out of my Saturdays, puppy classes in the morning and show classes in the afternoon. We then invested in another two Afghans, and all three did pretty well in the showring. I was never without yorkies, and at that stage, had one which was all of 700gms and went everywhere with me. She NEVER stayed home. She was at all the dog shows, and the yorkie breeders that were there, were very fascinated with this extremely tiny little YORKIE. My youngest son Michael started dog training and handled the one Afghan girl Alexis and she started getting her CC�s as a 9 month old pup and the first was in East London. Justin was Puppy of the year and also won the Junior dog title. His father was an import and his grandfather won Crufts many years ago and that alone speaks volumes. To win Crufts is a very big achievement. We lost Justin our first Afghan, in 2008. He died at 15 years of age, he was truly a wonderful dog - he died of old age. He was never ill in his entire life. Our rescue continued over these years, and we were very involved when I say we, My Hubby, my youngest son Michael and myself. I volunteered at a local SPCA for a period of months after, I decided to stop work, having had my own Real Estate Company for a good few years. My Hubby and Michael would assist when time allowed. We also worked with a lot of German Shepherds with behavioural problems, and we trained these Shepherds. The result � we have a few attack trained GSD�s. Our yorkies however, have never had a problem with the larger breeds of dogs, in fact the biggest mouthed dog on our property is Prince Charming, known affectionately as Charm who will turn 6 years in March 2010 � he weighs 602gms. He is very vocal and will challenge any animals, size is irrelevant to him. 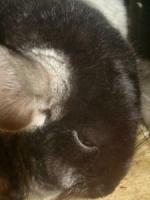 Over the years we have had numerous animals through our hands from rescue work. We decided recently to give up rescue. We were always a self-financed operation and in this day and age, it is costly. We also found, that people abused the situation and handed over their dogs with problems to us, their responsibility ended and ours began. We could never rehome animals that had been physically abused, eg. Noogie who was hit with a hosepipe for eight years, before the daughter in the household, grew up and brought the dog to us. Noogie is still with us and he was pretty ill recently when a spider must have bitten his tongue. The story appears on my blog. He was almost in Doggy Heaven, but we are now happy to say he is back to his old self again, he is around 12 or 13 years of age..
We have four Marmosets we originally started with marmosets 18 years ago. We had some of our own, and then about 8 or so years ago, we ended up taking over a breeders collection, when he thought them too old to be of any further use to him?????? We do not sell the babies, they remain as a family unit. We also have a collection of waterfowl (Exotic Ducks) as well as free roaming, peacocks, and guinea fowl, Ostrich, etc. We have been involved with waterfowl going on 12 years now. A gentleman came to fetch a hive of bees the other day, that had settled in a duck box, he asked how many ducks I sell a year? I had to laugh, we sell none, they are here for our own pleasure, and are also not hear for breeding purposes. Our bird area, as we call it, is home to hundreds of wild birds, who make their nests in the trees and the masses of bamboo. The noise in the early evenings from the wild birds chirping can be deafening at certain times of the year. They are obviously shouting goodnight to all their mates. We have hundreds of Weavers in our bird area, as well as Red Bishops, Sparrows, etc. I guess the free food they have on offer is also a huge bonus to them in the winter months. We have had horses, miniatures, recently which we rehomed to a wonderful Lady who has a manicured small holding. Two of those miniatures were horses with deformities. We are thrilled to know they are now all together. The two miniatures we owned, were also very good quality miniatures, the sire of the youngster being a best in show winner, they have now gone to an animal lover, the males will be gelded, so they are also pets and not for breeding purposes. These horses roamed our property, and ate all my roses, etc. We had miniatures years ago which died of old age. Our yorkies form a huge part of our lives. They are very special to us. We have a number and a lot of those are either sterilised and on retirement or are just too small for breeding purposes and are babies in our household. We are often asked if we would sell an adult teacup and the answer is definitely NOT. We grow up certain dogs, and those dogs we will not part with irrespective of the financial offer made. We also do not part with our retired dogs, we feel if they have been in our breeding programme, they have the right to retire with us in the home they have grown up in and where they have been loved. Our one retired stud has just turned 13 years of age, and our one girl is now 14 years old. 2009 we bought our first Biewer girl, and are delighted with her. She is an exceptional little dog. We are involved with the BYTCSA and will strive to breed the very best Biewers. We as a family are greatly blessed in our everyday lives, we no longer go on holiday as the responsibility of our pets is just too great. I have a dearly loved Cousin, who baby-sits houses for her family and relations, when they are on leave. She has often said she would never dream of coming and looking after our ZOO she would not sleep at night. Yorkies have formed part of my life since the late 1970's I could not imagine life without them.